The All Progressives Congress on Sunday said it would take legal actions against the National Chairman of the Reformed-APC, Alhaji Buba Galadima, and other members of the group, including arresting them. The National Legal Adviser of the Adams Oshiomhole-led APC, Babatunde Ogala, disclosed this in a statement. He said this in reaction to the formation of the splinter group, R-APC. 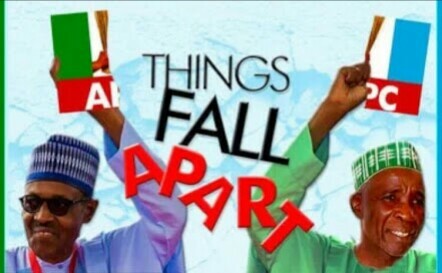 Aggrieved members of the New Peoples Democratic Party bloc and other aggrieved members of the ruling APC had on Thursday last week announced the formation of the R-APC. “That the party’s convention was improperly conducted by the convention chairman as consensus candidates were only subjected to a ‘yes’ vote in alleged contravention of Article 20 of the APC constitution. “That a group of delegates have come together 10 days after the successful conduct of the APC convention to, in their words, ‘take control and give legitimacy’ to APC now to be known as Reformed APC. In a veiled reference to alleged criminal breaches of the law on the part of the R-APC, Ogala maintained that the immediate consequence of Galadima’s action is that “he and his gang” had committed several criminal infractions against the APC. The legal adviser said by referring to himself as a national chairman, Galadima had committed the offence of impersonation. He said Galadima, knowingly made a statement which he knew to be untrue with the aim of deceiving Nigerians into abandoning the APC. The APC legal adviser further argued that the APC is a brand owned by members of the political party so registered and that by using the APC brand, the R-APC had infringed on the copyright of the APC and was thus liable. Ogala said the President Muhammadu Buhari-led APC administration was prepared to do all that was lawfully necessary to cleanse Nigeria’s political process of people who had become accustomed to brigandage and being unruly. In his reaction, the National Publicity Secretary of the R-APC, Mr Kassim Afegbua, said, “This long epistle to the Romans with a series of legal jargon is only food for the ears of their political buccaneers and economic predators. “This so-called legal adviser does not need to bog us with this long, windy and twisted legal logic; all he needs to do is to approach a court of competent jurisdiction and sue us.